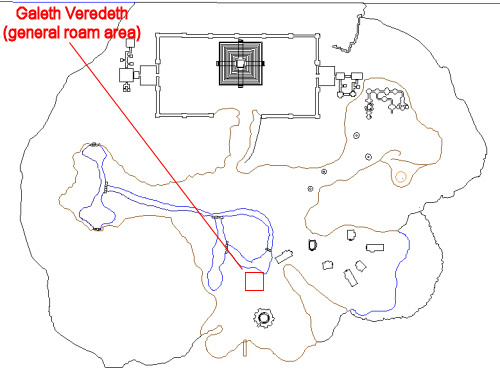 This solo task begins with Galeth Veredeth (click for map image) on Thuliasaur Island. Say "search" to request the task. You have been assigned the task 'To Remake Eden'. 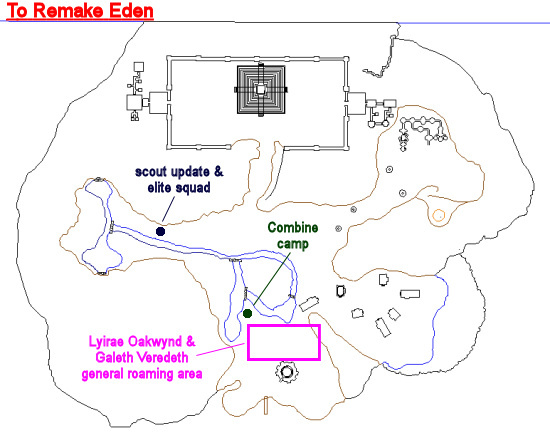 Galeth has asked you to investigate the Combine camp, find out what they are planning, and weaken them however you can. This is the camp northwest of Galeth and Lyirae's roaming area. As you draw near the camp, you hear voices arguing. Kill 11 mobs in the camp. These are of typical difficulty for the zone (hit for a max ~18,000; mezzable; splittable), but have fast respawn timers. In the camp is a ground spawn. Touch it to trigger the auto-aggro of 2x "a returning scout". If you're careful about it, you can do this and aggro them without drawing the attention of regular zone spawns. All mobs are mezzable, including the ambush mobs. You grab the Combine's manifest from the camp and open it. This is an update location near the tyrannosaurus area in the western part of the zone. Try not to get eaten by one of the locals. Kill 10 mobs among the elite squad. Same thing as the Combine camp earlier, only with mobs more closely spawned together (still splittable by normal means). Hail him until the task completes. This task is repeatable with a 6-hour lockout from the time of request. Don't be fooled. All of these mobs summon. a doomscale watchman parsed @ 3,340,115 hps..about half the other combine mobs ("a combine watcher"/ "a combine warden" parsed between 6.7- 7.8 million hps each)...needless to say making watchmans far quicker to kill and get credit for the step. Had little problem moloing the 2 Thuli partisan tasks on a 105/ max aa ranger, just very time consuming kills. These mobs also DO NOT summon, unlike the other combine mobs. Pretty easy mission. Single a mob, beat it down (takes a while since they have a lot of HPs), rinse and repeat. Not very imaginative mission compared to some of the earlier ones in this progression arc. XP is utterly miserable, too, for the killing. You get about 3% regular XP for the completion. The Combine Mobs have an ultrafast respawn cycle. It is possible to solo pull e.g. with druid snare or groupsnare spells to pick one out. Some have a fairly amount of hp, the caster are done very fast compared to the warrior mobs. Solution for getting the book: Mezz all around the campfire, send somebody with protection in and after spawning kite them out (optionally after mezzing). Druid/Ranger snare is cool, Enc mezz is godly with Deadening Wave and Bewilder at Rk.II. Never had a resist (in opposite to Rk.I). Everybody in the group gets the ground spawn like in nearly all cases of the new expansion if one member takes it from the floor. Three Scouts jumped our 5 PC (Dru105,Enc105,Mag102,Bst104,War104) + Healer Merc crew. Mezz and take them solo or offtank them, no problem at lvl 104+ "group only geared". Elite Squad is the same, except you get about 2 if snare-pulling the nearest, next was a single then we had 4 at once, a mezzer makes life here very easy. They don't have a wide aggro range. Good spot is on the Tyranosaurus side at the hill. The Triceratops on the other side roaming the scene up to the statue and possible adds could result in using the spot there. The mobs have again a fairly amount of hitpoints. Experience from these mobs is awful low at lvl 102. To get a blue per kill in AA is much, not to mention no movement at the exp-bar. After the quest is done, I wouldn't repeat it for experience, only give 1-2 blue AA at lvl 105, at lvl102 it seems a more. The only thing which is worth is the Partisan-Bonus with 4AA and about a blue Exp at Lvl 104/105. The combine mobs seem to have 6.5 million hit points for caster type, up to 7.5 million for the melee type mobs. The elite camp mobs are the same.